Updates from the Nikonians Academy. 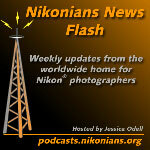 Download your copy of The Nikonian, #36! Capture Control Pro v 2.0. D3 and D300 manuals are online now! Check out samples from the D3 from our friends at Imaging Resource and LetsGoDigital. Sigma updates their 50-150 f2.8 DC and 70-200 f2.8 EX lenses. Adobe Camera Raw v. 4.3.1 is out for download.